I have been a vegetarian all my life. Every time I read a post on how to save money that includes “go vegetarian” as one of the pieces of advice, I get a little uncomfortable. It is not bad advice, but there is much more to it than simply going vegetarian. What is really being said is — skip meat for a day or two every week, and eat rice, beans and vegetables. Eating rice and beans is fine for one or two days, but can you imagine eating that meal every single day? Meat in itself has a complex taste but a lot of veggies, get their complex taste from the spices and herbs added to them or the way they are cooked. A meal with veggies, fruits, nuts, grains, dairy, herbs, oil and spices to get all the nutrients for a well-balanced diet can get as expensive or even more than a meat -based diet. That doesn’t mean we have to waste money on expensive plant food and exotic spices. It is not as easy as it seems but as with any diet, a vegetarian diet can also be made delicious on the cheap. Buy what is in season: This is one of the best ways to save on produce. When the fruit or vegetable is in season it is very cheap, stock up – freeze, can, make jams, sauces, etc. Buy staples from warehouse stores: If you do not have a grocery store with bulk bins, the next best bet is Costco or Sam’s Club. When I initially started substituting quinoa for rice, I used to buy the small pack of quinoa for $5 which would be enough for two or three days max. I was overjoyed when I found quinoa for the same $5 but for 4 lbs. at Costco. I never buy produce from Costco, as I know I will waste it unless I have the time to process and freeze it quickly. 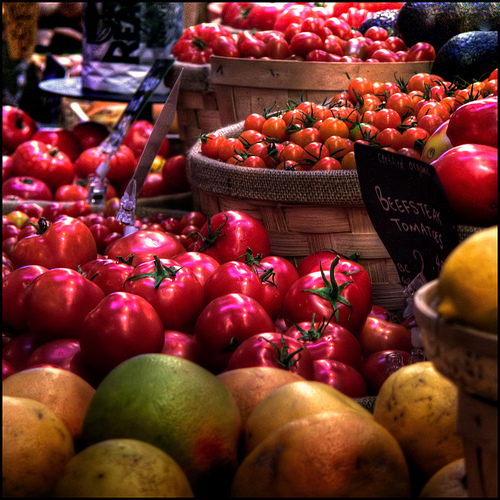 Local farms and farmer’s market: Local farmers markets have always been a hit or miss for me. Yes, I will be supporting the local farmers; yes, the produce is much fresher than the grocery store but they are not necessarily cheaper. Sometimes they can be double the price of something that is on sale in a grocery store. But, there are some items that are cheap, much cheaper than the grocery store. Know what grows well in your local area and what items are cheaper in your local farmers market. Hit the farmers market (even just for a fun weekend morning) once a month or so, and stock up on those items. Pick your own: Check to find if there are any pick your own produce type farms nearby. They have been much cheaper than the farmers market goods. Learn to recognize ripe fruits and veggies: No, the beautiful red tomatoes in the grocery stores are not necessarily “ripe.” They are just beautified. Fruits and veggies in the correct stage of ripeness have a LOT of flavor on their own, which means you need to use less spices and other ingredients to make a delicious meal out of it. Shop around for a CSA or form your own CSAs: We are blessed to have plenty of Community Supported Agriculture (CSA) programs in the area where we live. As with farmers markets, they are not always the cheapest, so we had to shop around for a CSA that fits our needs. There is also another program which I plan to utilize next year – form your own CSA sort of deal. A few families in our town have got together and negotiated rates with local farms. Every week members have to fill out an order form for everything they want that week. A volunteer consolidates the orders and the local farms drop off their produce at the volunteer’s home. The volunteer then sorts the veggies and fruits into boxes which will have to be picked up by the members. For the volunteer’s efforts and use of her home, every member pays $10 per quarter. Check and see if you have something like this in your area. If you are close to an Amish community, they have a lot of great produce, fresh from their garden for cheap. Ethnic stores: Ethnic stores are another excellent way to save money on spices and exotic produce. I cook a lot of Indian food. I have tried to buy stuff from Kroger only to balk at the prices and put them on the list for my next Indian store visit. If you are trying to cook a lot of gourmet foods, go to the source and hit the local ethnic stores instead of the big box grocery stores. Grow your own: This is another idea that might or might not work depending on your circumstances. In our previous house, the soil was so horrible we had to buy soil, build a square-foot garden and start a garden from the scratch. We got a lot of delicious veggies but economically, I am not sure it made sense. Now that we have our own house, we can plant a lot of plants that will give fruits year after year. I am planning a full-fledged vegetable garden next year and am very hopeful that this time it will make economic sense, too. It is always a financially prudent decision to have an herb garden though. Herbs are very cheap to grow and very expensive to buy. Know when you splurge: Anything with an “organic” label is expensive. We do not buy much organic produce. To get certified as organic the farmers have to spend quite a bit of money. So they might be following all the practices of being organic without the name tag. Talk to your local farmers and find out about their farming practices. You might get your “organic” produce for a fraction of the grocery store prices. And finally, being vegetarian is NOT equal to shopping at Whole Foods. We used to waste a lot of money by letting stuff go bad. I would stock up on things with the full intention to save money and eat healthy but I wouldn’t have time to cook everything before they went bad. I have changed my shopping and cooking habits to fix this problem. If you are stocking up, process them within a day or two: I buy quite of bit of exotic produce from ethnic stores. I make time to either partly prepare them or at least cut them up in to meal portion sizes and freeze. Processing all of them at once also has an added advantage of leaving tons of scrap to boil and save for soup stock. Less prepackaged: Prepackaged food is tasty but not as healthy or cheap as cooking from scratch. If you want convenience food, prepare, portion it and freeze. Learn to cook: It seems obvious but cheaper and healthier meals are much easier if we can take the time to cook. Vegetarianism is not by default cheaper or healthier than a meat-based diet. It has to be done right and be well-balanced. 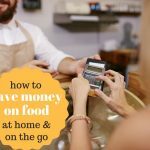 Whichever diet you are on, basic steps like planning a meal, shopping based on what is on sale and freezer meals always save money. I still think going vegetarian is good frugal advice; presumably someone eating a healthy diet would still be eating vegetables and the other staples of a vegetarian diet anyway, just with meat added. Our food budget is pretty low, but then we do eat a lot of beans! I cook primarily from scratch, most of our food is vegan (cheese was a big budget-buster for us), buy in season, and stock up on basics (boxes of pasta, cans of tomatoes, etc.) when at their lowest price point.